I chuckled when I was first briefed about Razer’s latest concept, Project Linda. It’s a phone dock that turns the Razer Phone into a laptop! That concept has been done before, and it has always been deeply and profoundly stupid. But Razer’s take on the dumb idea has just enough polish, even in this concept stage, to actually feel kind of cool. And it’s totally because Project Linda uses the phone as the touchpad. There’s an undeniable cool factor to having a touchpad that also happens to be a 120Hz 5.7-inch display. Razer says that should Project Linda ever move from prototype to production, then the phone would double as an actual display, showing relevant information when playing games or using certain applications. For now, it goes dark and you just get a supremely glossy touchpad to control the laptop. It does most things a touchpad is expected to do. You scan scroll with two fingers or pinch to zoom, and for a left click, you just lightly tap the phone’s glass. The tapping has the biggest learning curve, but I picked it up quickly in the time I spent with Linda. What you’re actually controlling is Android, with a custom desktop skin by Sentio. Whenever you connect the phone to the laptop, the skin pops up onto the laptop’s 13.3-inch 1080p display after a suitably Razer-ish (i.e. green) splash screen. Then you have access to all the contents of your Razer Phone, only vaguely Window-ized by Sentio, a company which also produces laptop docks for Android phones—though none nearly as elegant as Project Linda. The whole thing feels reminiscent of the latest version of Chrome OS, which also lets you use Android apps on a laptop. 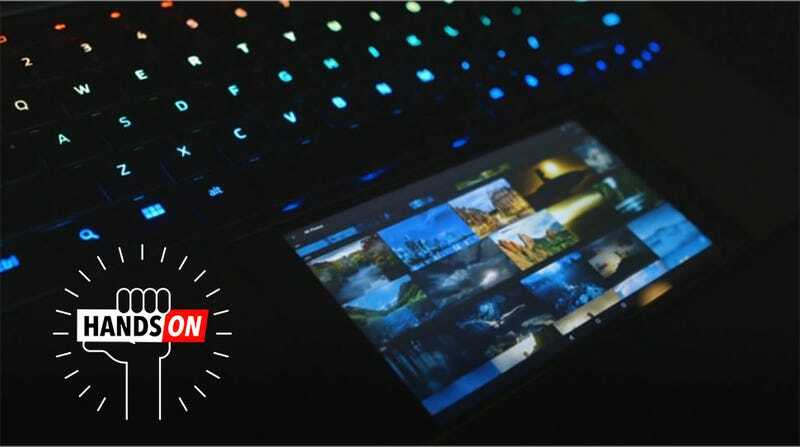 But Razer claims the idea wasn’t to take advantage of the increasingly desktop-friendly nature of Android apps. That was just a bonus. Instead, the company wanted to marry two of its products, the Razer Phone, which launched last year, and the Razer Blade Stealth. At a glance Razer seems to have accomplished its goal. This thing looks and feels like a Razer Blade Stealth. It’s only 2.7 pounds when the phone’s in place, and just half an inch thicker than the standard laptop. The thing has a USB-C port, as well as USB 3.0 and a 3.5mm audio jack. Razer says it would also love to fit some kind of display output on the laptop. That should be doable as the guts of the things are pretty sparse. The important stuff is all on the phone. The laptop part consists mostly of a 53.6 Whr battery (enough to charge the Razer Phone three times over), storage (so you can leave files or giant apps on the laptop), and a 4K display (so you can see stuff). But let’s be real, the coolest thing about the Linda isn’t the specs, it’s how the phone actually docks with the laptop. Because it’s totally mechanized. There’s no jamming things in or trying to seat the phone just right. Instead you drop it into a suede-lined slot where it sits flush with the laptop. Then you press a single button, and with a little whir, a USB-C plug pops right into the phone’s port. To undock you press the same button. And if you do it enough times, the phone will bug out and the Razer rep will take it from you. This thing looks and feels incredibly polished, but it is definitely still a prototype. Besides that bug (the phone takes a few seconds to switch from the Sentios desktop to the normal phone launcher) there were a few others I noticed in my time with the device. But that’s why this thing is called Project Linda and not the Razer Phone Dock or Razer Death Scorpion Rattle Killer or something. It’s Razer dipping a toe into the water and seeing what things look like. And with Android and Chrome continuing to merge, it’s actually not a bad time to perform experiments like this. In fact, this is easily the best version of this generally terrible concept I’ve seen. I could almost, almost, see myself coveting this—something I haven’t done since my Motorola Atrix was the most disappointing phone I ever purchased.